Manchester’s most notorious downtown intersection may have to find a new name. After decades of planning, work is slated to begin this spring on a major redesign of "Malfunction Junction" – the intersection of routes 30, 11 and 7a. The long-awaited project includes two traffic roundabouts, new sidewalks, vintage street lights, and more. Manchester planning director Lee Krohn has spent 20 years working on the problem of tie-ups at the infamous T-shaped intersection. He says the spot has always been a choke point. "Even in the history of Manchester, written in 1961, it talks about traffic jams in the center of town 200 years ago, the only difference being they were horse and buggies stuck in the mud," Krohn said. The situation worsened with the growth of ski resorts and vacation homes and the coming of the outlet stores that turned Manchester into a busy retail destination. Krohn says the town began contemplating the issue in earnest in the early 1990s. The town also began requiring developers of major projects to contribute to a fund to eventually help solve the traffic problem. "We all knew this intersection would need a dramatic and expensive fix," he said. "We didn’t know what it would be yet. So we came up with an equitable approach: that each new major project would contribute to a fund that would eventually help pay for a fix." The town held meetings and votes on a number of proposals before deciding to build a pair of traffic roundabouts. That vote was ten years ago. But Krohn says it’s taken that long, as the project expanded to include underground power lines, street lights, water and sewer line repairs, and landscaped pedestrian areas. "And I think most people are breathing a sigh of relief that after 20 years it’s finally going to happen," said Krohn. 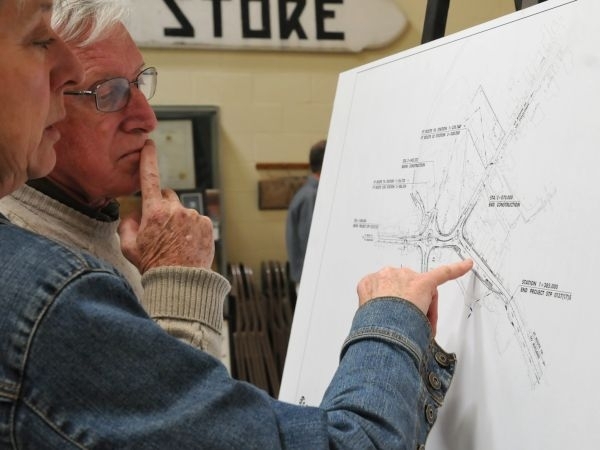 The project recently went out for bids and the town held an open house to display the plans. "I think the improvement to our sidewalks and cross walks is a big ‘aha’ for me," said Bill Drunsic, who owns Spiral Press Café, which will be right in the middle of the two-year construction project. Drunsic thinks the disruption will pay off. "This central area is a bit difficult to navigate right now and I think it will be much more pedestrian friendly when we’re done," Drunsic said. Cathy Stewart says she’s had some close calls trying to turn left into oncoming traffic. "So I’m really looking forward to this and it’s really going to be pretty," Stewart said. But Karen Preissler is less impressed. "I think that it’s a lot of money we’re sinking into it and a lot of time," she said. "And then we were talking about the different kinds of trees, how expensive they are why do we need an expensive tree like that. Like this Japanese tree lilac, ivory silk? We’re getting four of those." The project is mostly paid for by federal highway money administered by VTrans. Manchester’s longstanding Junction Improvement Fund is expected to cover the town’s share. Business has been good this summer in Manchester despite a major construction project.